Barrus Farm, located in Goshen, Massachusetts, is a historic pegmatite collecting site that has recently been reopened to collectors following a three-year study and reworking of the area by a small team of mineral collectors. 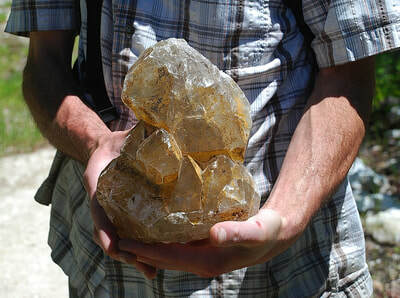 Clevelandite, tourmaline (elbaite, indicolite, and schorl), yellow muscovite, and quartz are abundant, with lesser spodumene, goshenite, pink muscovite, and morganite. This site is open to collectors only through prearranged club trips and not to individual collectors. 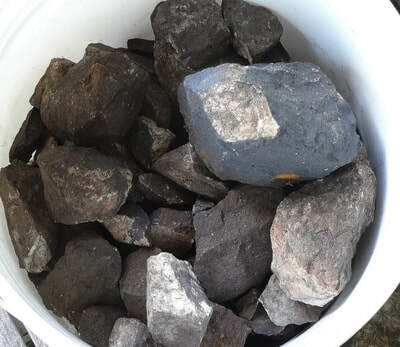 Sledge hammers, smaller rock hammers, chisels, and wedges are necessary to break larger boulders, but tailings piles and soil are best explored with garden trowels and screens. 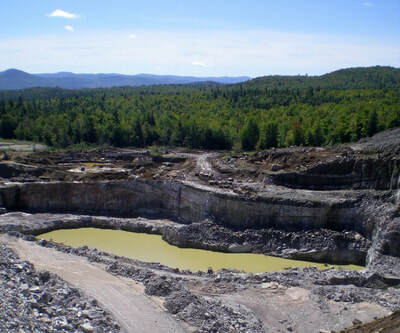 Betts Mine, in Plainfield, Massachusetts, is an old manganese mine located in the Hawley mineral belt of metamorphosed hydrothermal massive sulfide deposits. 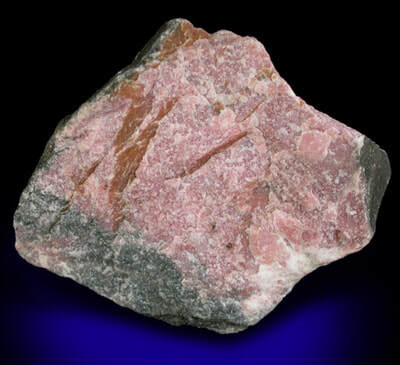 It is well-known for producing rhodonite and rhodocrosite specimens that may be polished into striking cabochons. 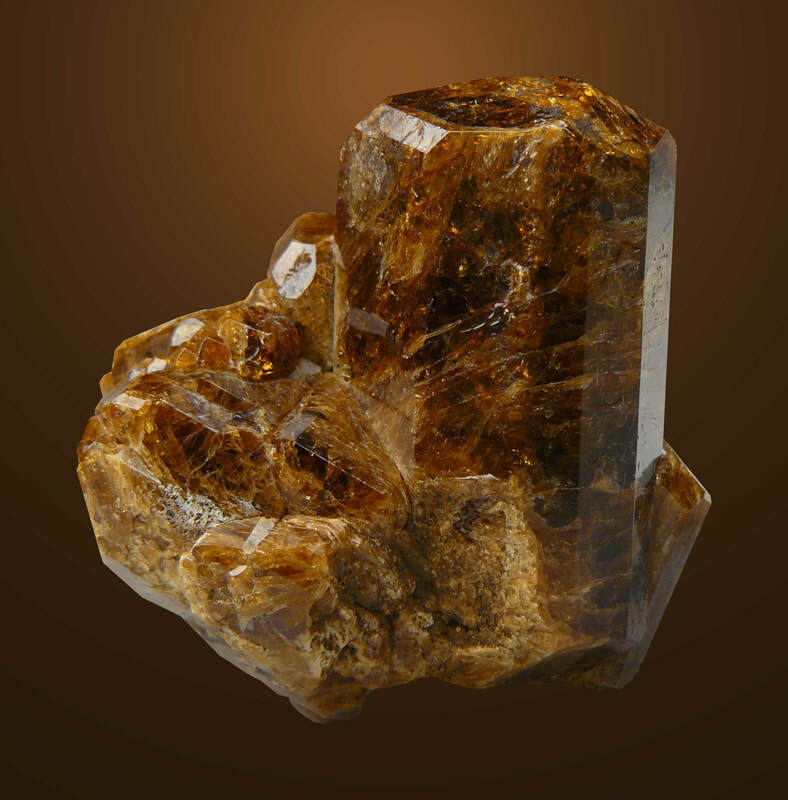 Cummingtonite, almandine–spessartine garnet, pyrite, pyrrhotite, chalcopyrite, and manganese oxides have also been found. This mine is open to collectors only with the prior permission of the owners. 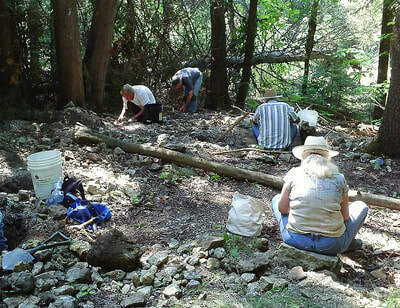 Since much of the collecting is on dumps excavated from the four main mineral zones, shovels, trowels, and other garden-type digging tools, as well as screens, will be most useful. 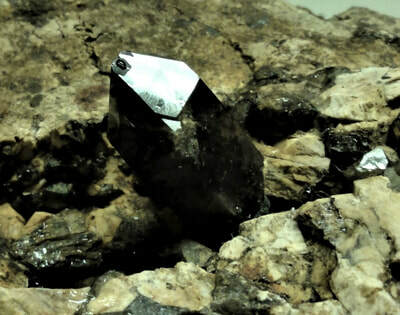 Small hammers may are useful to chip rocks coated with black manganese oxides when searching for rhodonite and rhodocrosite. 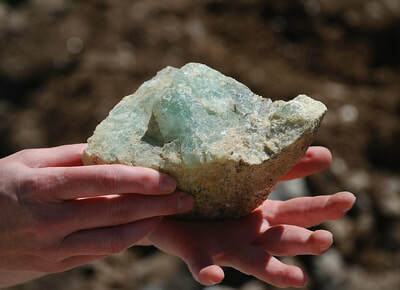 Beauregard Mine, located near Alstead, New Hampshire, has produced crystals of greenish-blue aquamarine beryl and greenish-yellow helidor beryl from a granite pegmatite. 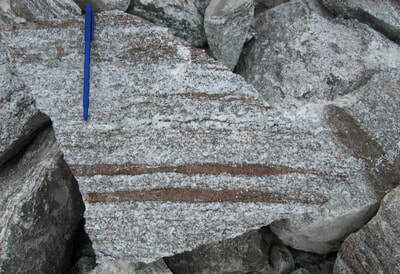 Almandine garnet, schorl tourmaline, graftonite, and triphylite have been reported in addition to quartz, muscovite, alkali feldspars, and biotite typically found in pegmatites. This mine is open to collectors only with the prior permission of the owners. Since much of the collecting is in pits and on dumps, shovels, trowels, and other garden-type digging tools, as well as screens, will be most useful. 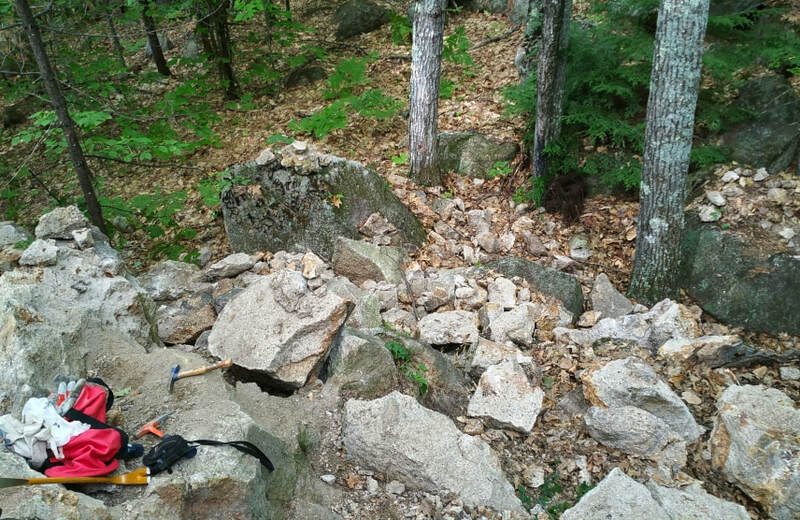 Folsom Gulch, located in Center Ossipee, New Hampshire, has produced smoky quartz and amethyst scepters, microcline, albite, fluorite, beryl, topaz, bertrandite micros, siderite, and goethite from pockets in the Conway granite. This site is currently closed to collectors. 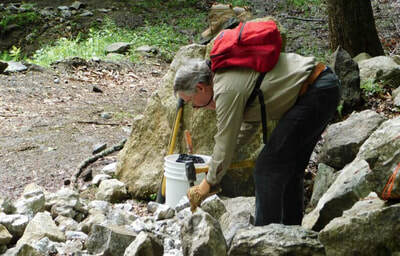 Terrain is steep in places, making collecting at the best areas challenging. 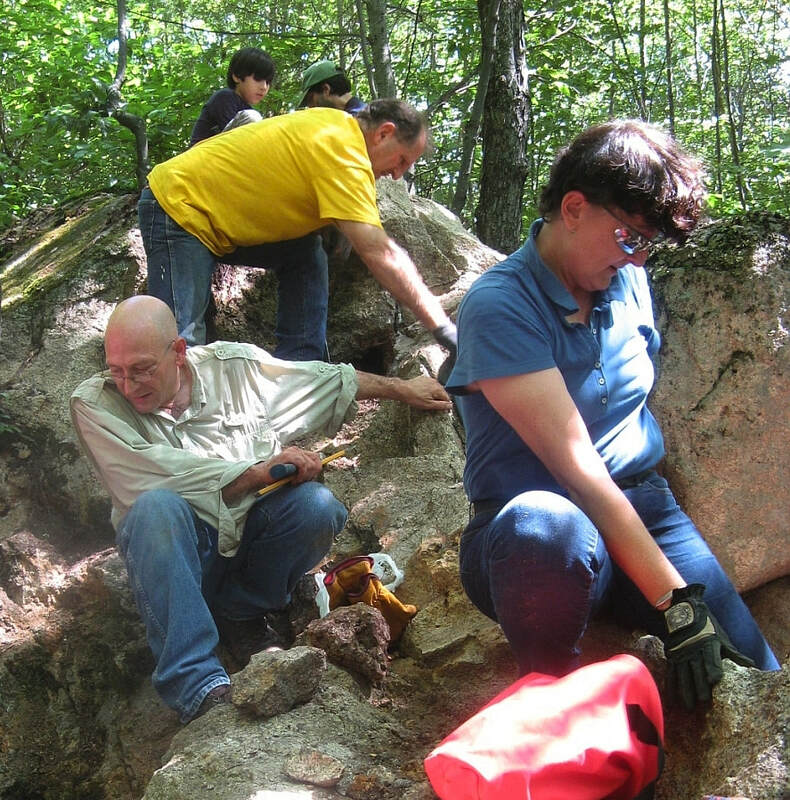 Sledge hammers, chisels, and wedges are necessary to open up pockets in ledges. Garden trowels and screens are useful when sifting through weathered granite on the ground. Palermo Mine, located near North Groton, New Hampshire, is a world-renowned locality for rare phosphate minerals, such as laueite, strunzite, stewartite, palermoite, and whitmoreite, many collectable only as micromounts. 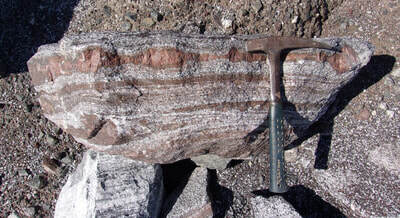 This old granite pegmatite locality, once one of the largest mica producers in the United States, contains nearly 150 different mineral species. 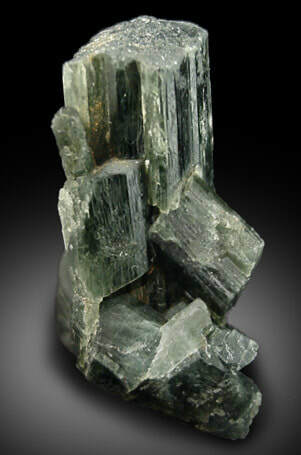 Crystals of greenish-blue aquamarine beryl, greenish-yellow helidor beryl, and quartz exceeding 12 inches in length have been found occasionally. Dark blue scorzalite makes attractive cabochons. A number of the less common phosphate minerals can be found in vugs in weathered triphylite and lithiophilite. 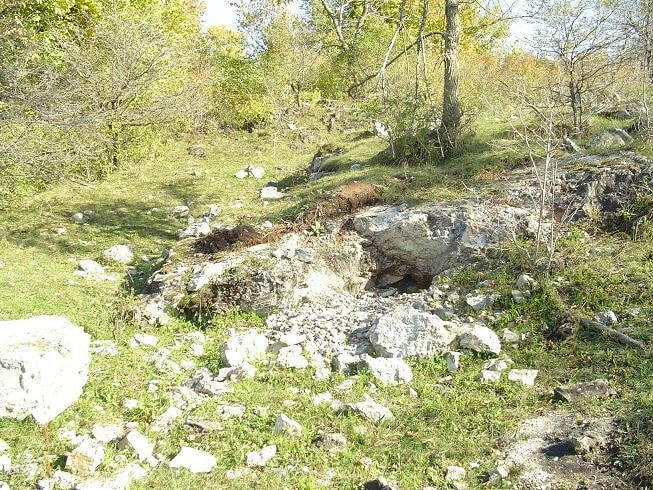 This mine is open to collectors only with the prior permission of the owners. 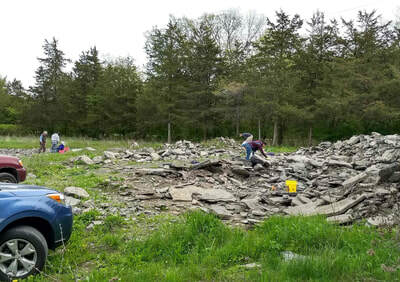 Since much of the collecting is in pits and on dumps, shovels, trowels, and other garden-type digging tools, as well as screens, will be most useful. 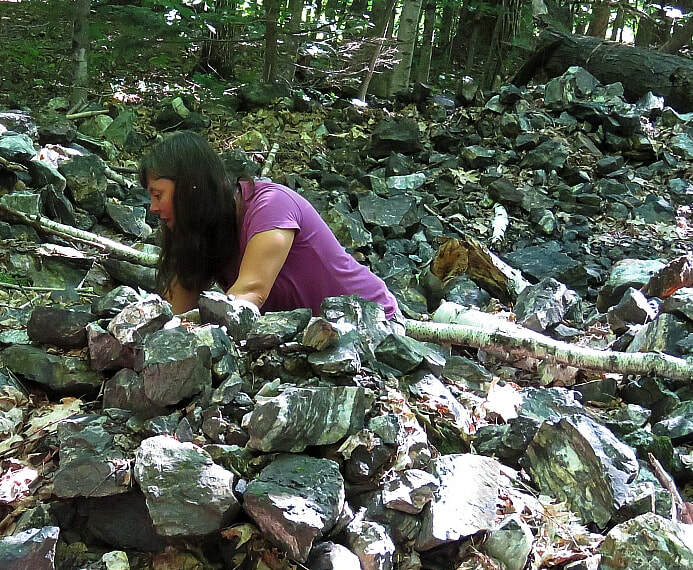 Collecting into bedrock underground requires hammers, chisels, and pry bars. 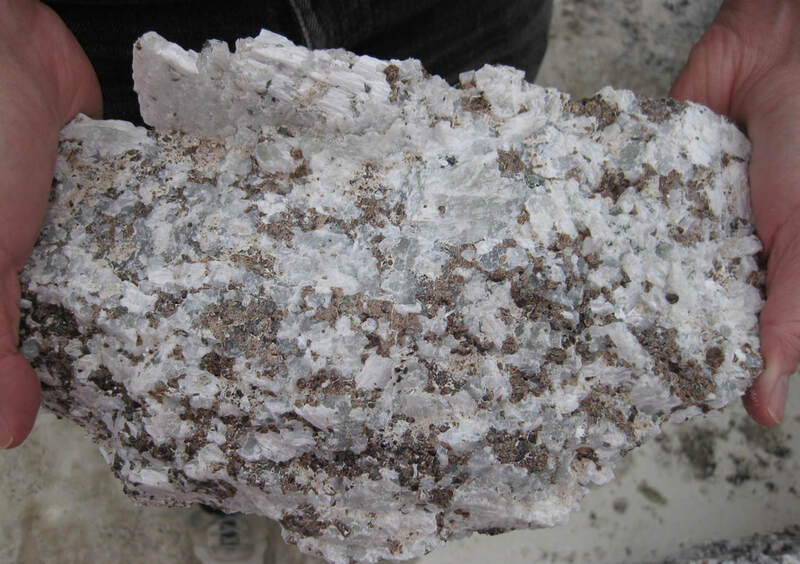 Plume Mine, located near North Groton, New Hampshire, is another granite pegmatite locality that has produced green beryl, microcline, albite, blue scorzalite, as well as two rare phosphate minerals, gormanite (green) and souzalite (blue), collectable only as micro crystals in vugs. Since much of the collecting is in pits and on dumps, shovels, trowels, and other garden-type digging tools, as well as screens, will be most useful, but hammers and chisels are also recommended. Bush Farm, located southwest of Richville, New York, has produced terminated cinnamon brown fluor-uvite crystals from small workings for many years. Some of the fluor-uvite is associated with terminated white tremolite. 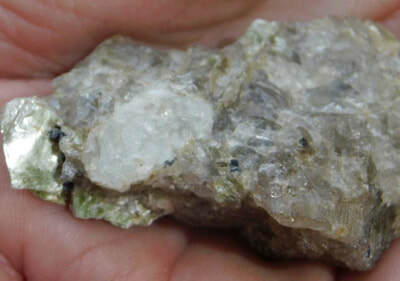 Fluorapatite, white diopside, and calcite are also found. This site is open to collectors for a fee. Shovels, trowels, and other garden-type digging tools, as well as screens, will be most useful when working the old dumps. 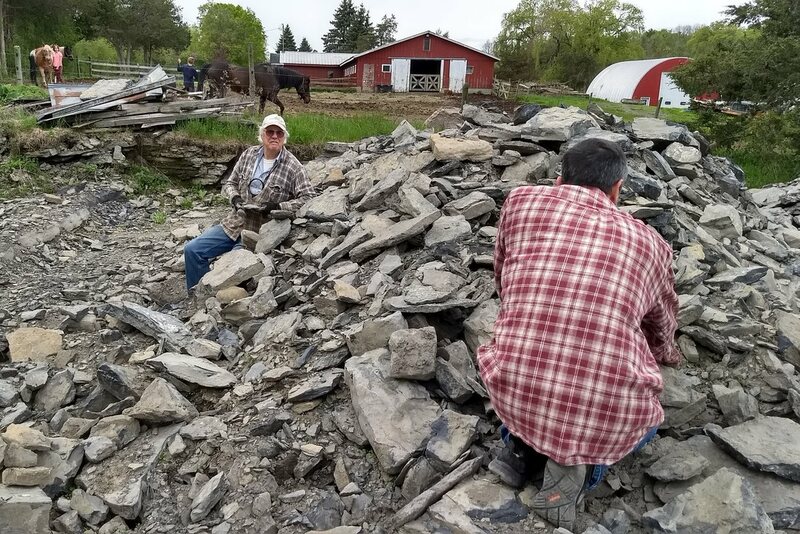 Additional areas of mineralization occur throughout the farm and require heavier equipment such as sledge hammers, chisels, and wedges to effectively explore them. 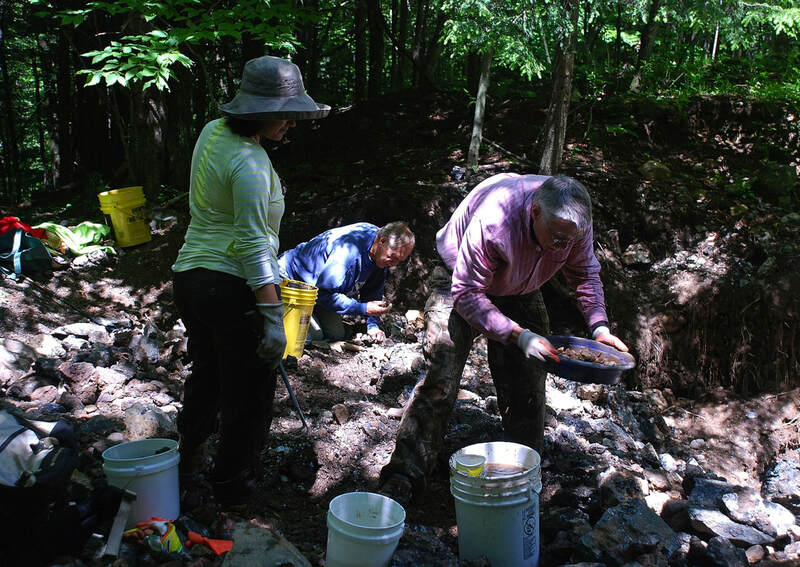 Hickory Hill, near Fonda, New York, is a well-known locality where Herkimer diamonds may be collected. The Hickory Hill locality is open to collectors for a fee only during the Memorial Day, July 4th, and Labor Day holiday weekends. 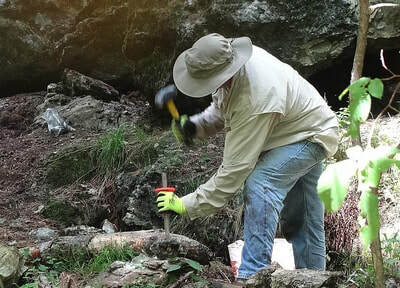 Most of the collecting is either by exposing vugs and seams in exposed bedrock, requiring hammers, chisels, and pry bars, or in pits and along the ground at the base of outcrops, where shovels, trowels, and other garden-type digging tools, as well as screens, will be most useful. 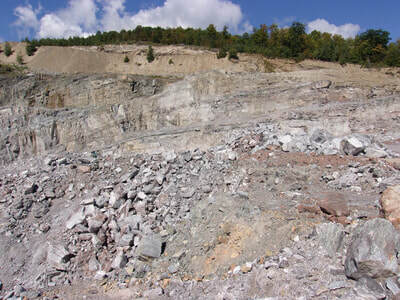 Lewis Mine (Seventy Road Mine), near Lewis, New York, was one of the largest commercial producers of wollastonite in the United States. 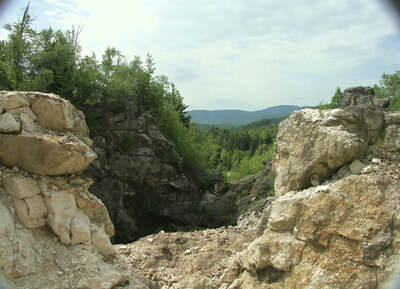 The wollastonite deposits are located along a 25-km-long belt of metasedimentary and metaigneous rocks that border the northern and western sides of the Westport anorthosite dome of the Marcy anorthosite massif. These rocks intruded the Adirondack Highlands around 1150 Ma and were overprinted by granulite-facies metamorphism about 100 million years later during the Ottawan Orogeny. Rocks in the ore zone include mafic and granitic gneiss, amphibolite, quartzite, pelite, marble, and skarn. The skarn is composed primarily of garnetite, garnet–pyroxene rocks, and wollastonite–garnet–clinopyroxene ores. 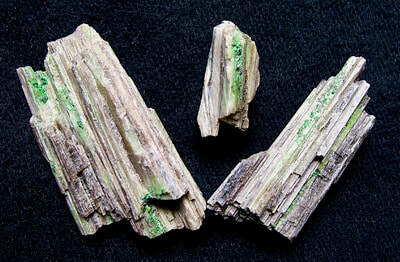 The wollastonite is white to pale greenish-gray and occurs in large bladed to acicular crystals. Most of the pink to orange equant and recrystallized garnet is grossular, variety hessonite, although some is more andradite-rich. 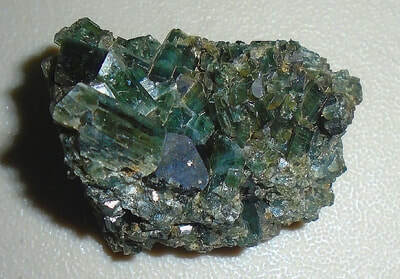 Tiny dark green equant crystals of clinopyroxene, generally diopside, are scattered throughout the ore. This site is currently closed to collectors. Although the areas open for collecting depend on mining activity, shovels, trowels, and other garden-type digging tools will be most effective when collecting in the main pit and on mine dumps. Hammers, chisels, and pry bars may also be useful. Thick leather gloves are recommended when handling specimens, as needles of wollastonite are generally very sharp. 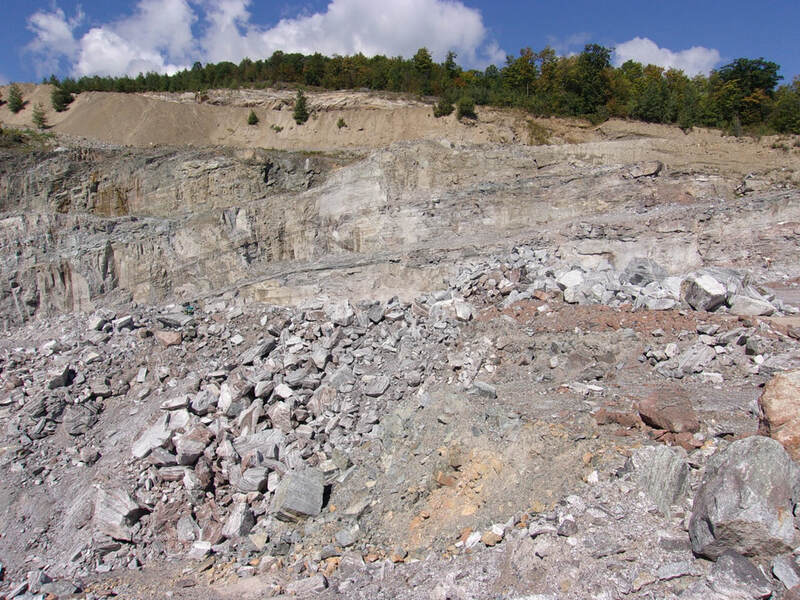 Oak Hill Mine, near Lewis, New York, is an open-pit wollastonite mine developed into the same host rocks as the Lewis Mine approximately 2.5 km farther to the east. 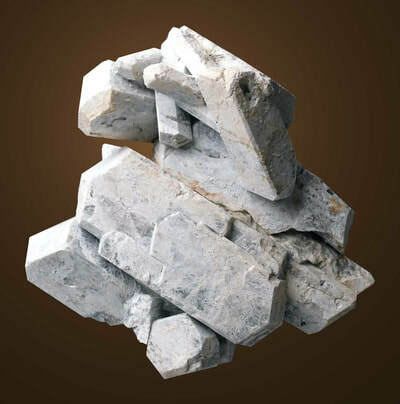 The wollastonite is white to pale greenish-gray and occurs in large bladed to acicular crystals. 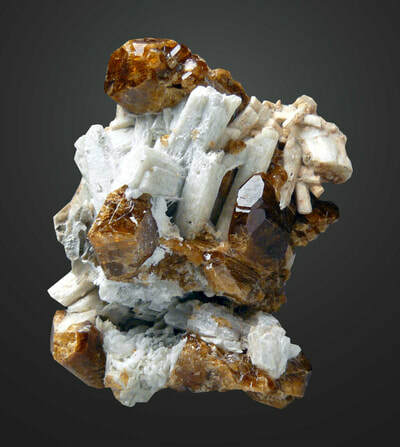 Small pink to reddish-orange equant and recrystallized grossular and andradite garnet occurs either scattered throughout much of the wollastonite ore or in garnet–wollastonite and garnet–quartz segregations. Tiny green equant crystals of clinopyroxene, generally diopside, are scattered throughout the ore. This site is currently closed to collectors but may be open to clubs for non-collecting tours arranged with the mining company. 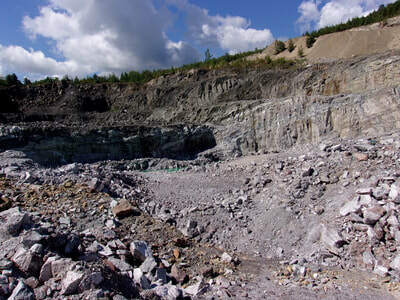 Although the areas open for collecting depend on mining activity, shovels, trowels, and other garden-type digging tools will be most effective when collecting in the main pit and on mine dumps. Hammers, chisels, and pry bars may also be useful. Thick leather gloves are recommended when handling specimens, as needles of wollastonite are generally very sharp. Owen Prospect, located northeast of Pierrepont, New York, is a relatively new locality where large crystals of scapolite and diopside are found, as well as albite (var. peristerite), allanite, titanite, microcline, phlogopite, and tourmaline. This site is open to collectors for a fee. Shovels, trowels, and other garden-type digging tools, as well as screens, will be most useful working the soil while digging down to mineralized bedrock along a forested ridge. 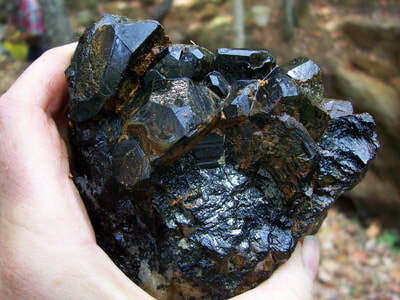 Powers Farm, located northwest of Pierrepont, New York, has produced terminated black dravite-uvite crystals for many years. Quartz scepters, yellow, green, and gray apatite, biotite, and pyrite have also been found. This site is open to collectors for a fee. Shovels, trowels, and other garden-type digging tools, as well as screens, will be most useful when working the old dumps. 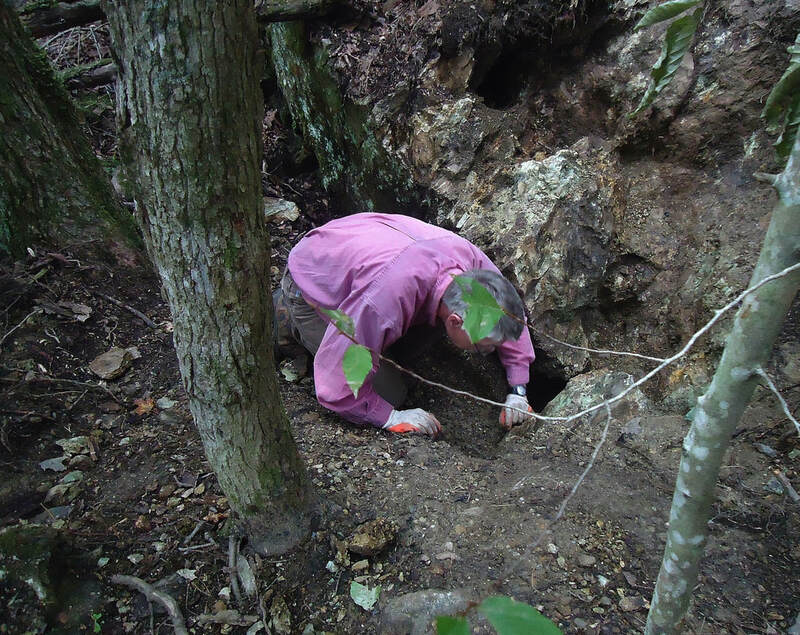 Additional areas of mineralization occur throughout the area and require heavier equipment such as sledge hammers, chisels, and wedges to effectively explore them. 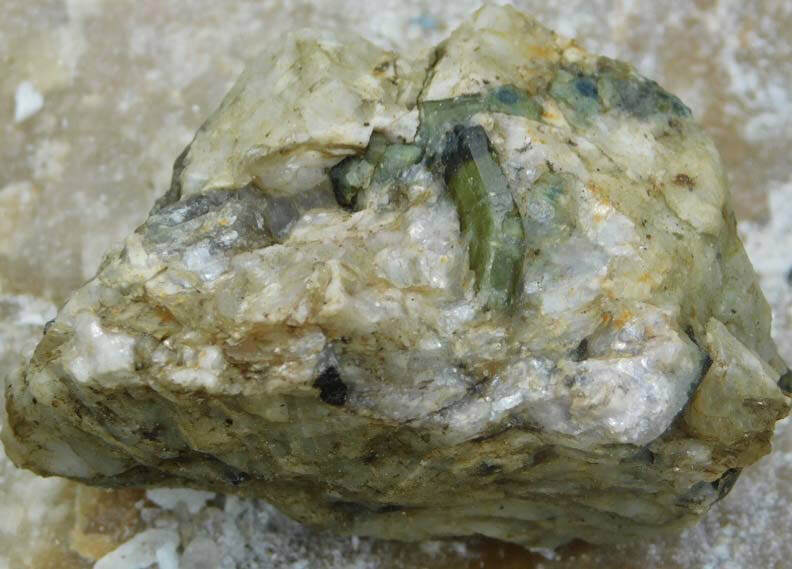 Rose Road, located south of East Pitcairn, New York, is best known for its terminated crystals of green diopside, albite, titanite, blue fluorapatite, and wollastonite, as well as more massive bluish-green calcite. More newly discovered workings contain terminated crystals of purple diopside, meionite, albite, and fluorapatite, some of which fluoresce under longwave and shortwave ultraviolet light. This site is open to collectors for a fee. Shovels, trowels, and other garden-type digging tools, as well as screens, will be most useful when digging through the dumps, while sledge hammers, chisels, and wedges will be needed to work ledges. Selleck Road, located south of Pierrepont, New York in the Taylor Creek State Forest, has produced attractive green tremolite crystals, as well as fluorapatite, fluor-uvite, phlogopite, microcline, heulandite, and massive pink calcite. Rock and sledge hammers, chisels, wedges, shovels, trowels, and other garden-type digging tools, as well as screens, will be most useful here. Hatch Quarry, located in Panton, Vermont, is well-known for producing the decorative fossiliferous limestone known as Panton stone from the Crown Point Formation. 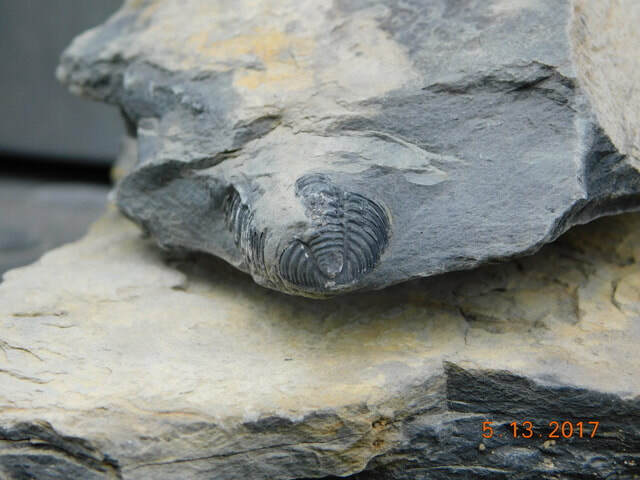 Ordovician brachiopods, bryozoans, corals, crinoid stems, gastropods, and rare trilobites have been found by collectors both in the main pit and along the higher ground north and south of the pit. Extraction of fossils from the hard limestone can be challenging. 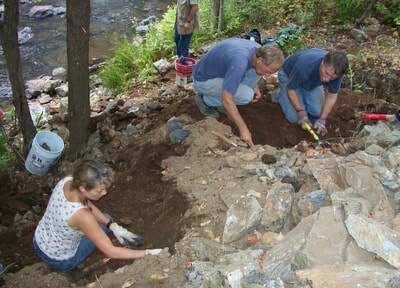 Collecting generally requires hammers, chisels, and pry bars. Collectors are urged to stay away from the precarious slopes at the top of the quarry. This active quarry is open to collectors only with the prior permission of the owner. Redmond Quarry is located a short distance to the south of the Hatch Quarry in Panton, Vermont. 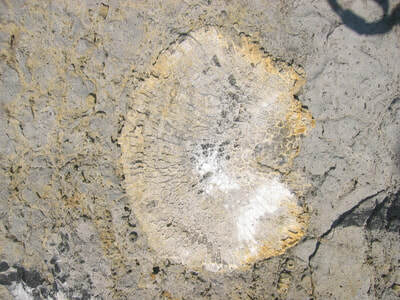 It is also developed in the Ordovician Crown Point Formation. 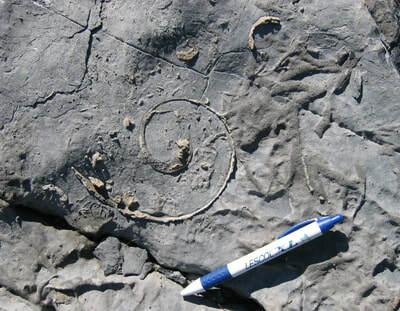 Many of the same types of fossils occur here, with trilobites being reported in greater abundance than at the Hatch Quarry. Extraction of fossils from the hard limestone can be challenging. Collecting generally requires hammers, chisels, and pry bars. 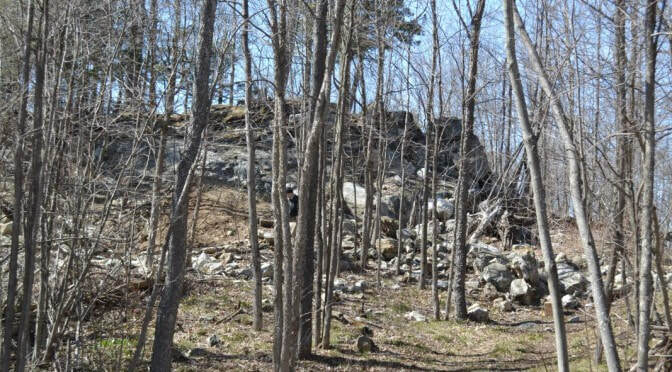 This quarry is open to collectors only with the prior permission of the owner. 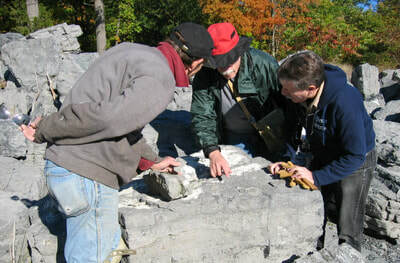 Sharon concretion site is located near Sharon, Vermont and is a productive "family-friendly" collecting site. Individual gray to brown siltstone concretions ranging in size from the diameter of a penny to that of a golf ball are commonly found at the base of the steep slope excavated in this sand pit and in the terrace of fine sand that extends away from the slope. 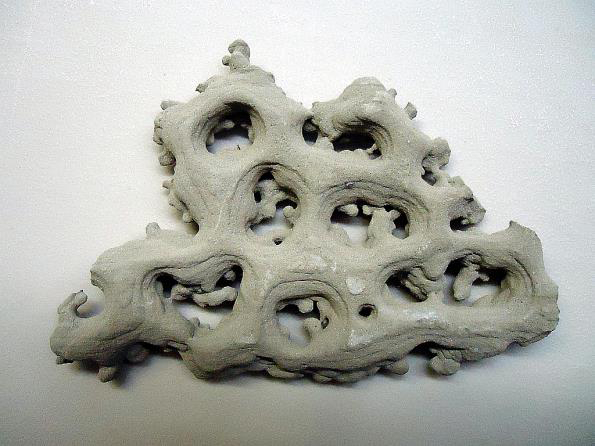 Larger concretions up to a foot long with an appearance of a lattice or Swiss cheese are less commonly found farther up the slope. 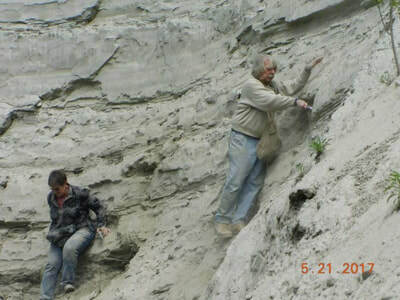 Extended periods of rain expose new concretions and carry them down the slope. 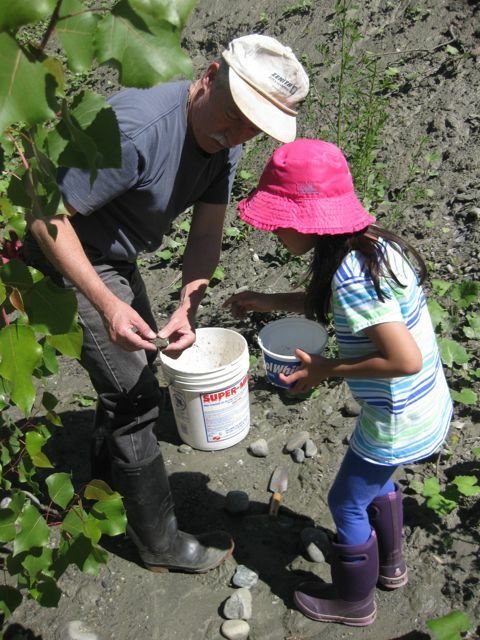 Simple digging tools, such as a garden trowel and small rake, are all that are needed; in fact, many concretions may be found just by picking them out of the sand with one's fingers. The concretions tend to scratch rather easily, so prized specimens are best wrapped before placing them in a bucket for transport. Collectors should wear rubber boots or sturdy shoes that they are willing to get muddy and wet, although sneakers might suffice during visits after extended dry periods. 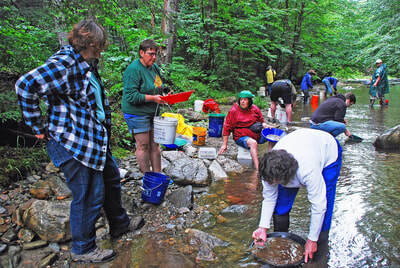 Soter's gold panning site is located in Ludlow, Vermont and is a great spot for both beginning and seasoned panners. The site is open to collectors only with the prior permission of the owners. 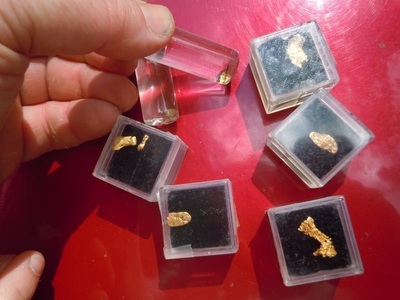 Collectors should bring a gold pan, one or two 5-gallon buckets to transport material to be panned, a shovel, and a small bottle (or 35-mm film canister) to hold the gold. The most efficient way to search for gold is to shovel gravel from an old dry stream bed into a bucket and transport it about 100 yards to an active stream. Collectors should wear waders, rubber boots, or sturdy shoes that they are willing to get wet, and long pants as a barrier against ticks and mosquitoes. 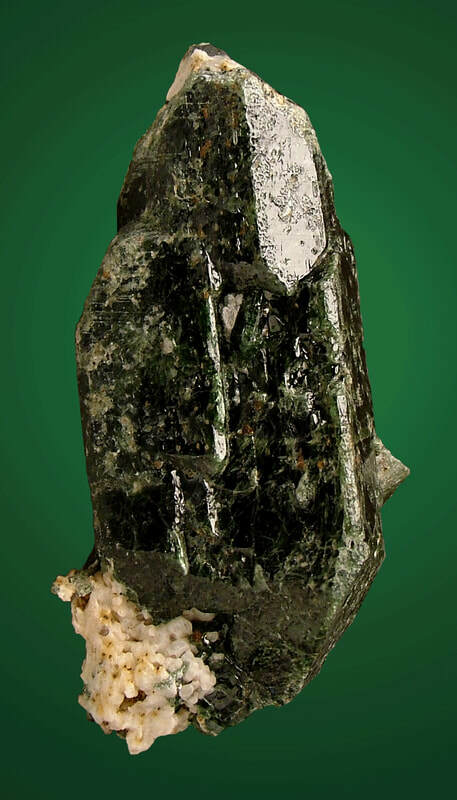 Orford Mine, located in Saint-Denis-de-Brompton, Québec, Canada, is an old nickel mine that has produced a number of beautiful specimens of green grossular garnet on light yellowish-green to light yellowish-gray bladed diopside, as well as small millerite crystals in calcite. This mine is open to collectors only with the prior permission of the owners. Since much of the collecting is on dumps, small hammers, shovels, trowels, and other garden-type digging tools, as well as screens, will be most useful. Collectors should bring a spray bottle filled with water to rinse off specimens and digging equipment, as U.S. Customs has been known to express concern about dirt being brought back into the United States.